WARSAW - Karolina Styczynska, a 20-year-old Polish university student, is dreaming of an unlikely career in Japan: becoming one of only a handful of foreign professional “shogi” players. 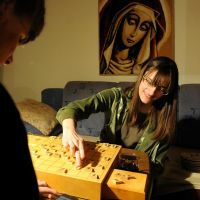 Styczynska first came across shogi — a chesslike board game — four years ago, when she was reading “Naruto,” a popular manga series that publisher Shueisha Inc. says has been translated into more than 30 languages, including English, French and Polish. The protagonist Naruto, an apprentice ninja, and a friend at the ninja school were seen playing a board game unfamiliar to her. Intrigued by the scene, Styczynska searched the Internet to find out what board game the characters were playing and hit upon a video explaining the nuts and bolts of shogi in English. Unlike chess, shogi allows the reuse of captured pieces, Styczynska said. In a shogi match, players can place any of their captured pieces on any square in any turn, and this rule makes shogi much more complex than chess. Styczynska was immediately hooked on shogi, which has a centuries-old history but has mostly been confined to Japan. She practiced the game for four or five hours each day, sometimes spending the entire day in her room, absorbed in the game, she said. Styczynska, a student of information technology at a local university, lives with her mother and twin sister in an apartment in one of the colorless communist-era residential buildings that adorn the streets of Warsaw. Her room hardly looks like that of a girl of her age. It is strewn with ornaments shaped like shogi pieces and fans signed by Japanese professional shogi players. On her desk are stacks of shogi-related books. The video that brought Styczynska into the world of shogi was created by Tomohide Kawasaki, a 33-year-old Japanese man living in Cologne, Germany. He is a member of the International Shogi Popularization Society, a nonprofit organization that aims to make the game popular worldwide. His video drew such strong reactions from shogi fans around the world that Kawasaki launched 81 Dojo, an English-language shogi website, in 2010. The number “81” refers to the number of squares on the shogi board. “I wanted to open an online shogi dojo where we can play against anyone in the world, with English as our common language,” he said. The online site has more than 6,000 registered members, with more than 500 shogi fans accessing it each day from around the world. Madoka Kitao, a 32-year-old female professional shogi player, encountered an unusually strong player in an online match on 81 Dojo one day. Kitao did not know the opponent’s identity because online players are often anonymous. Later, however, she was surprised to learn through Kawasaki that the player who had given her so much trouble was the teenage Styczynska. Last summer, Kitao offered Styczynska a two-week trip to Japan to practice shogi. Styczynska’s mother, however, was against letting her daughter go to Japan so soon after the outbreak of the Fukushima nuclear crisis in March. But Styczynska did not want to miss a golden opportunity to visit the birthplace of shogi, and persuaded her mother to allow her to go. After arriving in Tokyo, Styczynska took a qualifying test in a dojo attached to the headquarters of the Japan Shogi Association in Tokyo and was given an amateur 4 dan grade. Amateur players are ranked from “10 kyu” to “1 kyu” and then from “1 dan” and upward. “I didn’t expect it to happen so quickly,” she said of the rank given to her, which arguably makes her the top foreign female player. “The atmosphere of the dojo is something I got to like very much,” Styczynska said, adding that she liked being able to play with professional players there, likening it to being tutored in the game. Kitao believes that Styczynska is already strong enough to qualify as a professional female shogi player. “It’s amazing that she’s got this strong mostly through self-learning and online playing experiences,” Kitao said. However, Kitao is of two minds as to whether to encourage Styczynska to pursue the path of professional shogi. There are different systems of professional qualification for men and women, with male and female professional players competing in different tournaments. While the qualification threshold is lower for women, women’s tournaments offer such modest prize money compared with men’s that only a handful of women players can make a living on prize earnings alone. In Styczynska’s case, supporting herself while in apprenticeship far away from her home country could also be a problem. But Styczynska is willing to take on the challenge. “I would be happy to participate in professional tournaments,” she said. If she qualifies, she would be the first foreign woman to play in the world of professional shogi. In recent years, shogi has been growing in popularity in Shanghai and other Asian cities. 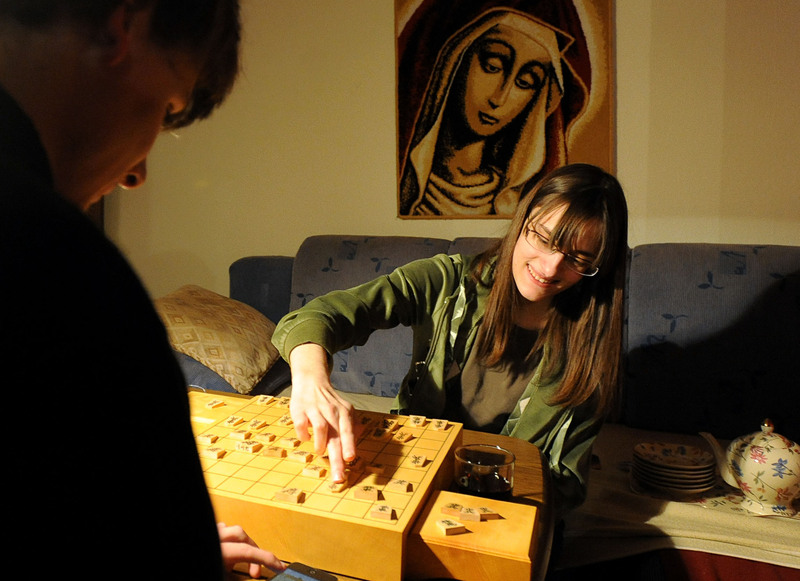 Still, compared with go, a board game with Chinese roots, shogi is lagging in expanding its international reach. There are hopes that Styczynska will serve as a bridge to Europe.